What makes Camp Ramah Darom unique? Here, we bring together a diverse community of talented, experienced staff, offer outstanding athletics and arts programs, and infuse a love of Israeli culture and Jewish heritage into everything we do. Campers gain new knowledge, skills, and experiences, which help them develop strong Jewish identities— through prayer, a lively song session, or even a game of basketball. The profound importance of community to the camp experience cultivates a strong understanding of communal connection and responsibility. Ramah Darom is an inclusive camp and offers Tikvah Support Program for campers with neurodevelopmental disorders. We also focus attention on developing our campers and staff into leaders, educators, and free-thinking individuals. What ages does Camp Ramah Darom serve? We have several programs which are based on the upcoming school grade of your child. Children entering the 3rd grade may participate in our 12-day “Taste of Ramah” program. Campers entering the 4th-5th grades may enroll in our “Taste” program or a four-week long session, while campers in 6th-10th grade may elect to attend for either four or eight weeks. Our 11th-grade program, Gesher, is a summer-long program that incorporates leadership, counselor training, and a 12-day trip along the east coast. We also offer two five-day family camp programs during the summer for families with “campers” 10 and under. What kind of program and activities will my child participate in this summer? The daily schedule is packed with a variety of exciting activities. Your child will choose from a range of both sporting and non-sporting activities in which we stress skill acquisition and development. Additionally, swimming, learning, bunk activities, evening programs, daily prayers, and culturally-based activities are just part of your child’s daily life at camp. To obtain a list of a typical day at camp, please visit the Camp Ramah Darom website at www.ramahdarom.org. What are the requirements for staff to work at camp? What is the camper to staff ratio? Our selective hiring process requires applicants be at least rising college freshman who have a strong Jewish background and experience working with youth. Additionally, we seek staff members with maturity and strong character who have the ability to serve as positive role models. They must apply with three personal, educational, and professional references. Another characteristic which differentiates us from other camps is our camper-to-staff ratio. Overall, we have one staff member for every two campers. Within our bunks, the ratio is no more than four campers to one counselor, ensuring that each child receives as much individualized attention as possible. Are there scholarships and/or financial assistance available from Camp Ramah Darom? A principal foundation of Ramah Darom’s mission is a commitment to ensure that any parent has the opportunity to give his or her child the enriching benefits of Ramah Darom. While the majority of financial assistance comes from local sources, Ramah Darom does provide limited scholarships. For those needing additional assistance, we encourage you to speak to your rabbi, contact your local federation and ask community leaders about funding opportunities in your area. We also offer payment plans. Additionally, you may contact our office to obtain a financial aid application. Please see our Financial Aid 1, 2, 3 for more information. What type of contact will I have with my child? A major goal of the summer camping experience is to build independence and self-reliance. Therefore, direct phone contact is not permitted. Your child will be strongly encouraged to write home at least once a week. Parents may also communicate with their children through letters and a one-way email system. In order to assist parents in communicating with the camp and checking on the status of their children, the camp maintains a staff of parent liaisons. This group consists of skilled individuals who have extensive experience in working with children. The parent liaisons will answer any questions you may have about your child’s summer. Messages left for parent liaisons will be returned within 24 hours. Are parents permitted to visit camp? Due to the short length of each camp session, we are not able to offer a visiting day. However, those of you who would like to see camp have the option to bring and/or pick up your child on arrival and departure days. If your child is staying all summer, you may pick him/her up during the two-day intersession period. Many of our campers have various dietary restrictions from lactose intolerance to peanut allergies. Parents may alert us to special dietary needs by submitting a special diet request form so that we can ensure that your child receives all the special accommodations that he/she requires. What is the Kashrut policy at Camp Ramah Darom? All meals served at camp are kosher. We maintain separate meat and dairy kitchens. All ingredients within our kitchens, as well as the cooking process, are supervised by our camp mashgiach and are in compliance with the rules set forth by the National Ramah Commission. What medical facilities do you have on premises? During the summer, our infirmary is staffed at all times with two physicians and three nurses. These skilled professionals are available to provide routine care and to respond to emergencies. Medications are distributed during meal times from our mini infirmary. If your child requires emergency medical service, there are three hospitals within an hour radius of camp. Where is Camp Ramah Darom located? Camp Ramah Darom is located in the town of Clayton, Georgia in the North Georgia Mountains. We are approximately two hours northeast of Atlanta. Our campers come from 11 southeastern states, and many fly to Atlanta, where they are met by our staff and transported to camp. Also, many parents drive their campers directly to camp. How will my child know where everything is? 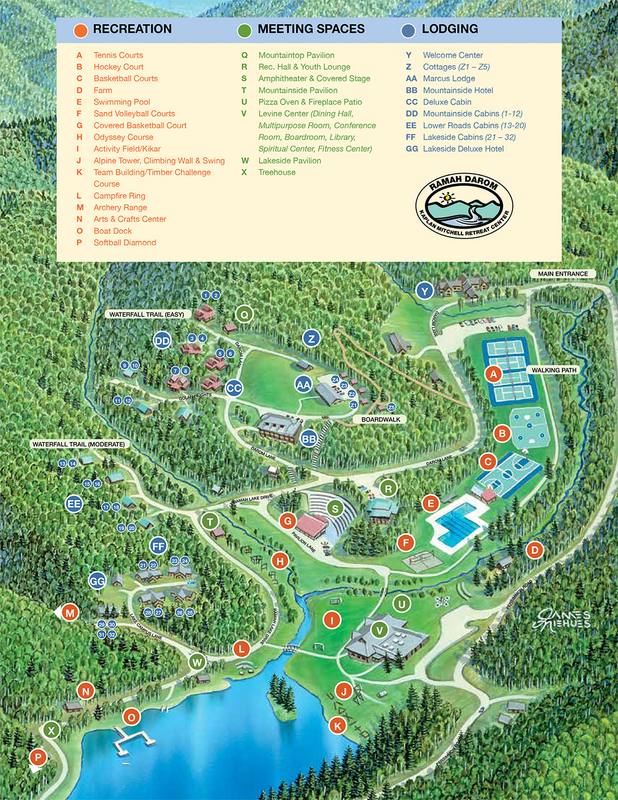 Here is a map of our campus so your camper can see where different cabins, activities and meeting spaces are located. What kind of security does the camp have? During the summer, our camp is guarded 24 hours a day. We have a team of Israeli security staff that work together with off-duty local law enforcement to patrol inside and outside the camp. Where can I access applications and other forms? You can find all of the necessary documents on our website under “camp” or contact our office at 404-531-0801 or info@ramahdarom.org.